LOS ANGELES (CNS) — Congress must separate “the conversation about DACA” from the “larger issues” about U.S. immigration policy, because allowing the program to expire will lead “to a humanitarian crisis,” especially in Los Angeles, said Archbishop Jose H. Gomez. Archbishop Gomez’s column, dated Jan. 9, was posted on the websites of the Los Angeles Archdiocese and Angelus News, its multimedia platform. “Once again, we begin a new year with uncertainty and fear over immigration, and this year our leaders in Congress face a hard deadline” to preserve the DREAM program, said Archbishop Gomez. Within the borders of the Los Angeles Archdiocese, he said, there will be a humanitarian crisis if DACA ends because an estimated 125,000 young people protected by the program live there. DACA protects between 700,000 and 800,000 young people. “The story of these young people … is well-known. Brought to this country as children by undocumented parents or family members, they are not ‘illegal’ through any fault of their own,” Archbishop Gomez wrote. “The ‘Dreamers’ have lived their whole lives in this country — many are now in their 30s. In September, President Donald Trump announced that in March, he would end DACA, which President Barack Obama created by executive order in 2012. At the same time, Trump called on Congress to come up with a legislative solution by then to keep the program in place. Obama instituted the program to protect young people whose parents brought them into the country as minors when they entered the U.S. without legal permission. DACA has allowed them to receive a renewable two-year period of deferred action from deportation and get a work permit. 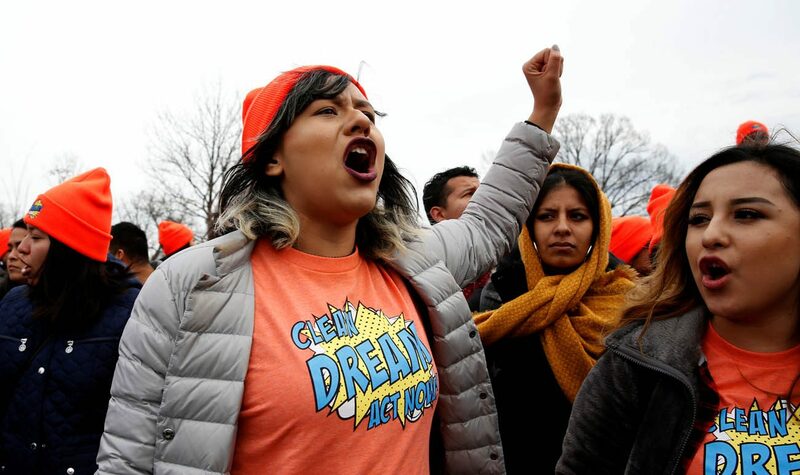 Advocates around the country have rallied to urge passage of the DREAM Act — the Development, Relief and Education for Alien Minors Act — to provide a pathway to citizenship for DACA beneficiaries. On Jan. 9, Trump and a bipartisan group from Congress met to discuss a measure that would keep DACA intact and include Trump’s demands for a border wall and other security measures. The same day, a U.S. District Court judge in San Francisco temporarily blocked Trump’s decision to rescind DACA, saying the U.S. government must start accepting renewal applications again from current beneficiaries of the program. The ruling, which is certain to be appealed, also said the government does not have to accept applications from those not currently covered by DACA. “Today, the ‘Dreamers’ are the ‘poster children’ for how broken our system is and how unhealthy and unproductive our political discourse has become,” Archbishop Gomez wrote. “By any measure, these are the kind of young people that our country should be encouraging. “In a letter to congressional leaders in September, more than 800 executives representing every sector of the economy agreed that DACA youths contribute more than $460 billion to our economy and another $24 billion in taxes,” he said. The nation’s immigration system “has been broken for too long and there is too much that is wrong,” he added, saying that “a serious debate about border security” is also important. “No one disagrees that we need to secure our borders and protect ourselves from those who would do harm to us,” he explained, but he urged the larger debate about border security and other immigration reforms be handled separately from the DACA issue. “Congress should take the time to debate the issues properly and to truly fashion an immigration system that reflects the global realities of the 21st-century economy,” the archbishop said. Besides discussing various proposals for protecting the border, he said, other issues to be debated should include how the country grants visas; what types of guest-worker programs are needed to provide workers, especially for the agricultural industry; and an honest examination of assumptions that immigrants take jobs from Americans. Also, “we need to think more clearly about our labor needs in renegotiating the North American Free Trade Agreement,” Archbishop Gomez said. “The point is that we need a total reform of our immigration system, and it should not be tied to the current debate over DACA and the ‘Dreamers,'” he added. “When people find they can vote themselves money, it heralds in the end of the Republic”. This is an issue of power, not the well-being of immigrants. I question the real motive of these so called Catholic leaders (who I don’t believe are really Catholic at all). The fact that they advocate for Obama’s unlawful executive order makes me wonder if they, like Obama and liberals, are motivated at least in part, by class envy. They can not continue to let illegal immigrant into this country. Their parents are at fault. I would have done the same thing. It is natural for the parents to take the easy way out. I will pray a rosary for them and a peaceful solution. Their parents created this problem not the US. They received free education, ,food, housing and medical coverage which is a lot more than my children ( US citizens) . Because of increased taxes to pay for these things they took from my children, money my family could have used. .Maybe while protesting in the streets they could also extend a simple THANK YOU. Remember it was your parents no matter what the excuse not my nation that created this problem. One final thing don’t carry on about how your parents did jobs no one else would. It must have been a lot better here than in their country or they would have returned home!!!! I don’t claim to know what should be done but I DO KNOW A SIMPLE THANK YOU IS DUE NO MATTER THE OUTCOME!!!!! !